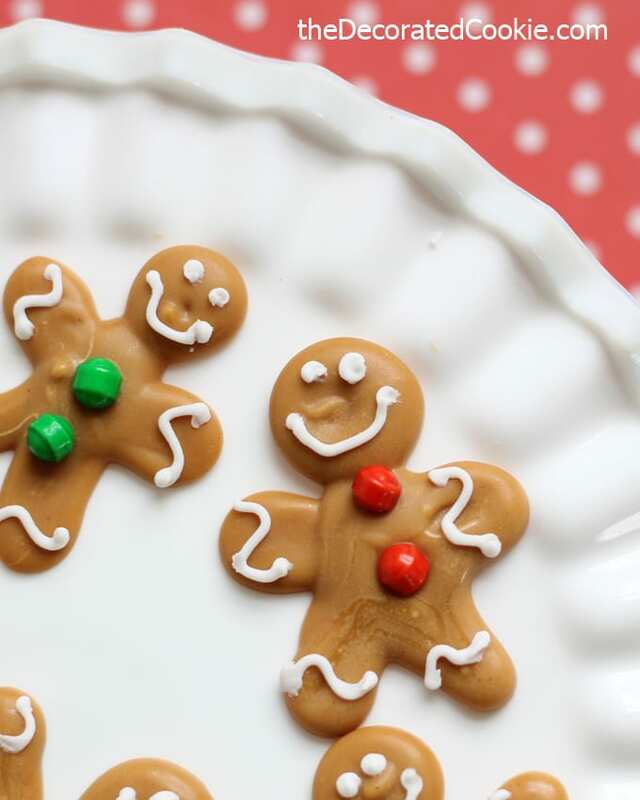 DIY mini gingerbread candies for a cute and easy Christmas treat. Package in favor bags, or use to top cupcakes and cakes. 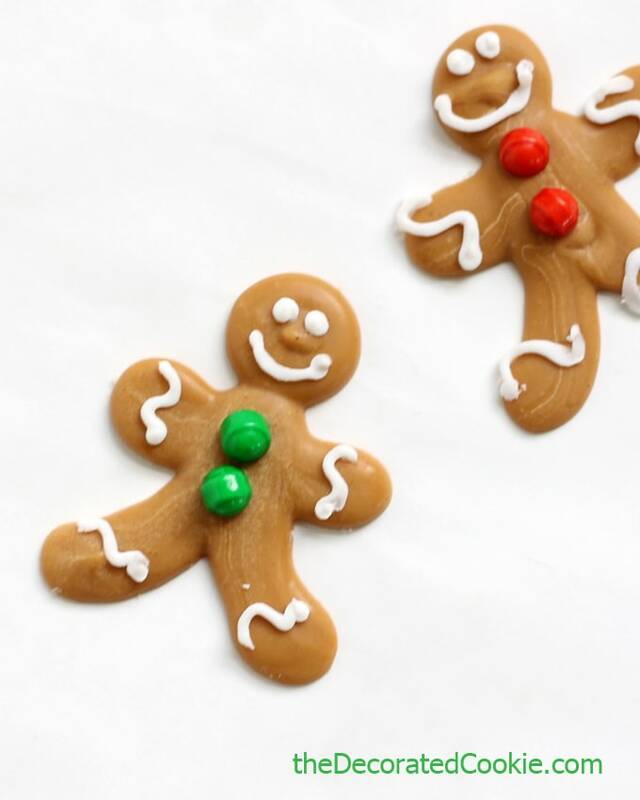 I can’t stop with the gingerbread man cuteness! 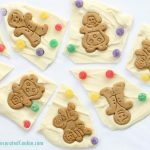 First these gingerbread man marshmallows. 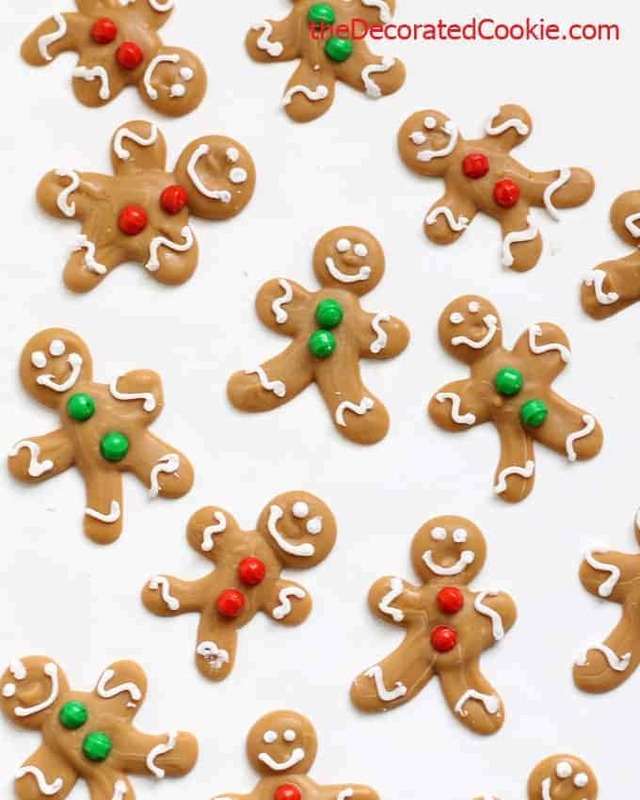 Now mini gingerbread man candy. 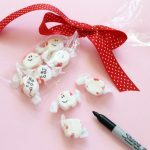 They are simple to whip up and you can use them as is or as cake or cupcake toppers. 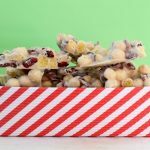 Or mix them with pretzels and nuts and dried fruit to make a sweet and salty Christmas snack mix. Now the ideas are flowing. And then package the snack mix in jars tied with red ribbon for homemade Christmas gifts. I can’t be stopped! *Find the candy melts, decorating bag and sprinkles at the craft store. 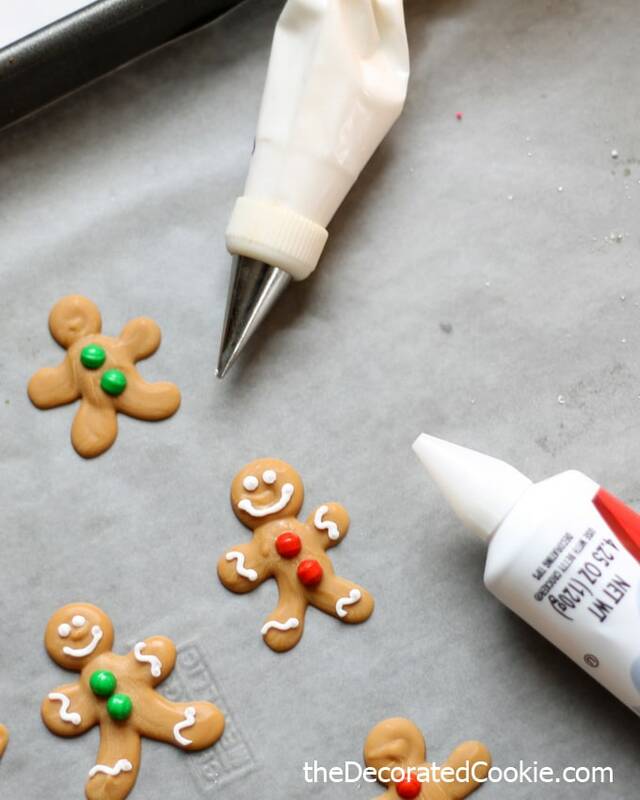 You’ll also find some decorating icing there, too, or in the supermarket. Snip a small tip on the icing or use a bag with a size 2 tip. For tips on finding supplies, click HERE. what to do: Line a baking tray with wax paper. In a microwave safe bowl (or directly in the disposable decorating bag), place 1/2 to 3/4 cup of candy melts. Microwave at 70 percent power for 90 seconds. Stir and continue to microwave at 30 second, then 15 second, intervals until fully melted and smooth when stirred. Pour into the disposable decorating bag. Twist the top and secure with a rubber band tightly. Snip 1/4 inch from the tip. 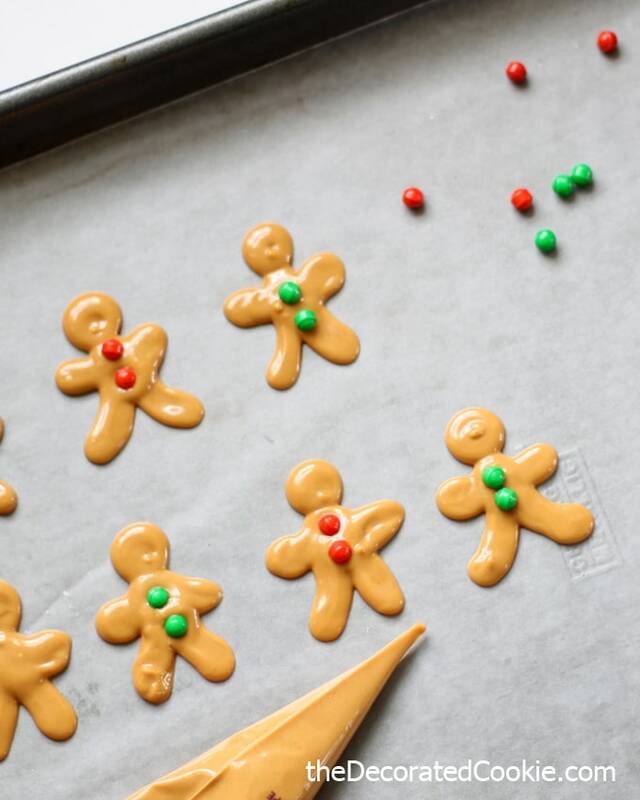 Pipe small gingerbread men on the wax paper. Place two sprinkles on the bellies for buttons. When set, pipe smile faces and squiggles with white. *Find the candy melts, decorating bag and sprinkles at the craft store. You'll also find some decorating icing there, too, or in the supermarket. Snip a small tip on the icing or use a bag with a size 2 tip. For tips on finding supplies, click HERE. Line a baking tray with wax paper. In a microwave safe bowl (or directly in the disposable decorating bag), place 1/2 to 3/4 cup of candy melts. Microwave at 70 percent power for 90 seconds. Stir and continue to microwave at 30 second, then 15 second, intervals until fully melted and smooth when stirred. Pour into the disposable decorating bag. Twist the top and secure with a rubber band tightly. Snip 1/4 inch from the tip. 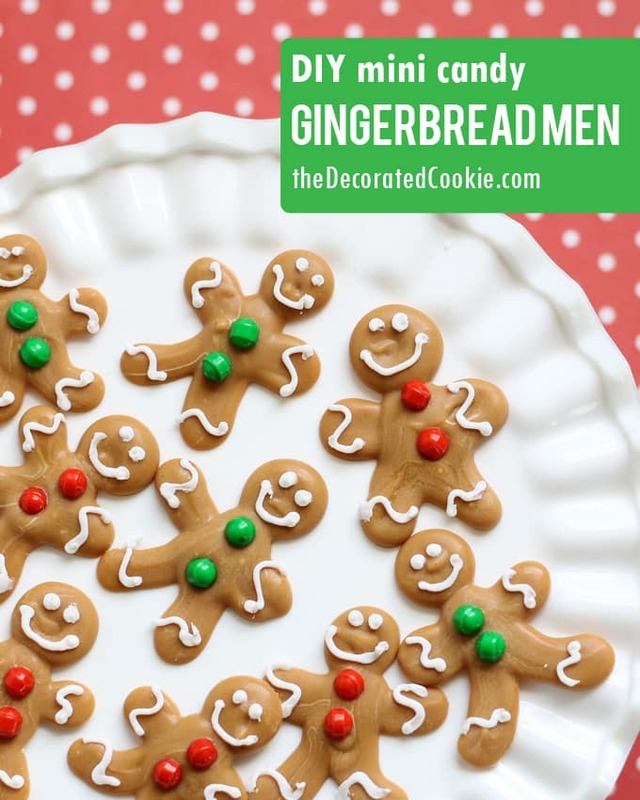 Pipe small gingerbread men on the wax paper. Place two sprinkles on the bellies for buttons. When set, pipe smile faces and squiggles with white. 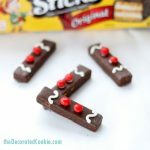 Note: The sprinkles below are different from the ones I used here. I couldn’t find the red and green sugar pearls online, but the ones I used I found in the craft store.